One thing I love to do is figure out distances to and from things, especially in relation to where I live. We moved to a new house last year. Our new house is only a 4 minute drive from the hospital, which is so great! Our old house was about a 15 minute drive from the hospital. Ever since we moved in, I’ve been saying I want to walk to the hospital from our house, but the thing is, there are only very few months in the year where this is possible because it’s SO HOT. January is one of the months where walking is doable, but don’t get me wrong, even in January you can work up a sweat taking a casual stroll through the neighborhood. The sun is bright and beaming all year long, no matter what the temperature. So the other day I decided that I needed to take a walk to the hospital from our house because I was curious to see how long it would take. I also thought it would be fun to take pictures along the way to so that you all could get an idea of what our ‘hood is like. It took 45 minutes. Way longer than it should have because #1 Leon is three years old. #2 I was stopping and taking lots of pictures along the way, and #3 we were walking through sand. Enjoy! Straw mats and bails of hay, and a straw house (far left side of the picture). Toilets and sinks and pipes for sale. Magaggi (our guard and one of Leon’s favorite people in the world) graciously obliged Leon’s request to join us for our walk. They’re holding their walking sticks that Leon picked out. Tire shop (with a creepy, hunched over, hand-drawn Michelin man). Meat grilling and chopping (and eating) shop. After a while of walking through the sand, Leon got tired and Magaggi offered to give him a ride. A shopping cart : A cart you shop at. You can get almost anything there, including extension cords, mosquito nets, bouncy balls and TV antennas. This list is obviously not exhaustive. These carts are everywhere. Pumpkins and sugar cane. This is sugar cane season. Sugar cane is EVERYWHERE. Just like walking at the beach. Why not transport people on top of transported goods? Two in one. Furniture store. Namely couches and doors. As I said, sugar cane everywhere! Another fruit and vegetable stand, right in front of a mosque. Cows rummaging through a trash heap by the hospital. A couple kids taking a break from pushing a wheelbarrow down the sandy road (not easy going through sand!) The CURE hospital is up ahead on the right. Final destination: CURE Hospital. My favorite place in Niger! 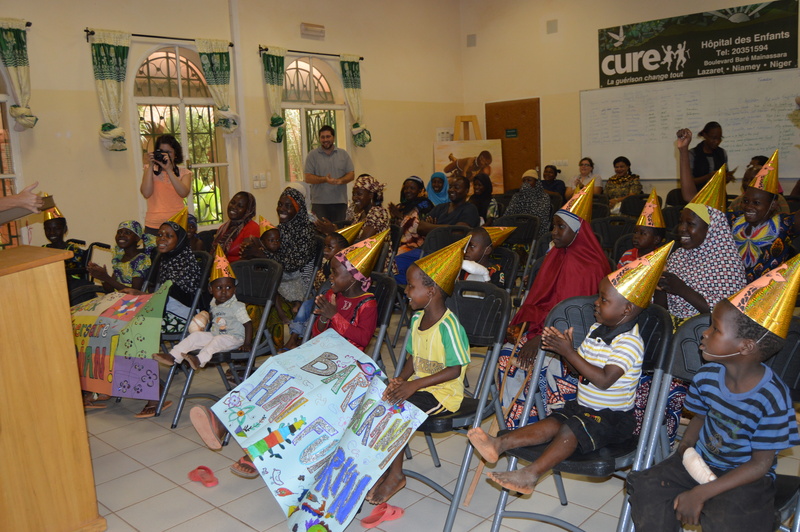 In December, we performed our 700th surgery for the year, a new record for CURE Niger. In 2014 we preformed 627 surgeries and we will end 2015 with around 720, so this is a significant increase. In addition to the dedication and hard work of surgical staff, this increase is also due to the fact that we were able to benefit from a number of different visiting surgeons this year, from other CURE facilities, and from elsewhere. We want to thank them all for their contribution to our success. In December we also performed our 3,000th surgery in our hospital since we opened our doors in October, 2010. 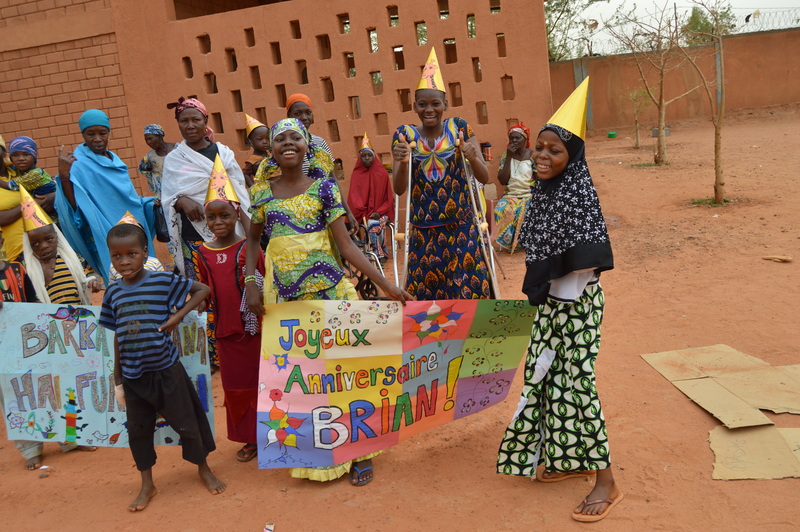 Finally, in November, the Clubfoot program treated their 1,000th patient since the program started in Niger. Among those 1,000 patients, 380 were girls and 620 were boys, and in all 1,602 feet were healed. 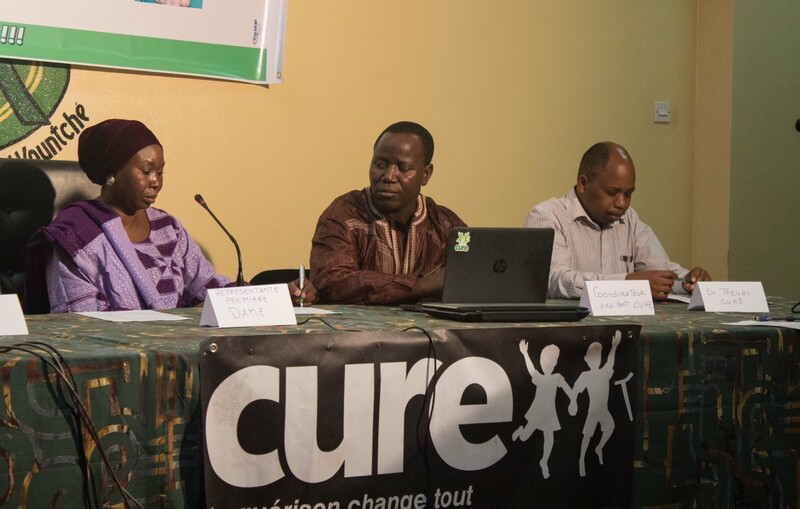 This means that all together, CURE has changed more than 4,000 lives since establishing a presence in Niger 5 years ago. When you include the friends and family members that have been impacted by the healing they have witnessed, and the love of God they have experienced at our hospital, the number is actually much higher. This is a great achievement, and we are very proud – it is worthy of celebration, however we know that all that we do and accomplish is ultimately due to God’s grace and mercy. To God the glory, our aspiration is to be instruments of healing in his hands. May God continue to use us to accomplish his goals for his Kingdom, and to bring his healing to the people of Niger. Believe it or not, sometimes it is hard to find a cast to decorate at the hospital. Sometimes we have a lot of patients at once who don’t need to wear a cast, and instead sport gauze wraps or bandages or slings or braces. We always try to adorn whatever we find, but there is no denying that plaster casts are the best material to work with. 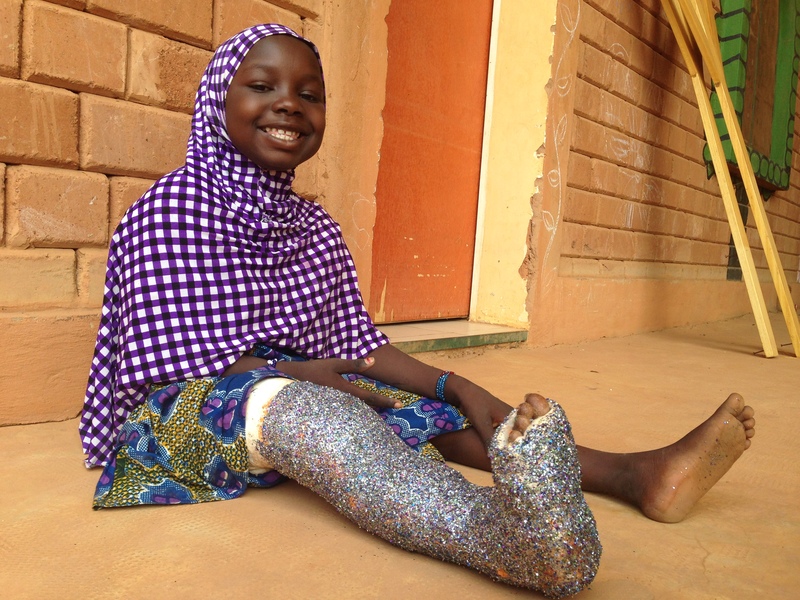 The kids feel the same way – sometimes they are disappointed if they do not get a cast put on, and they are always excited to come to the art therapy room when they have a leg or arm that is newly casted. Therefore, I was very pleased when I arrived at the hospital one morning and saw three kids brandishing three brand new clean white casts. They were excited to show them to me, and all three of them came to the art therapy room together. Since it was already Christmas time, as soon as I saw them together I immediately thought: Three Wise Men! We started working on the Magi, and we made good progress. We finished two of them with time to spare, but we were unable to finish all three because Rabila (and her cast) had to go back to her room for a nap. This was an unexpected bump in the road on the journey of the Magi, but no serious problem. I told them that we could finish the third cast the following day. The next day Rabila dutifully came in so that we could paint our third King of the East. We were working on it together when some of the kids came running in to tell us that we lost our first Wise Man! 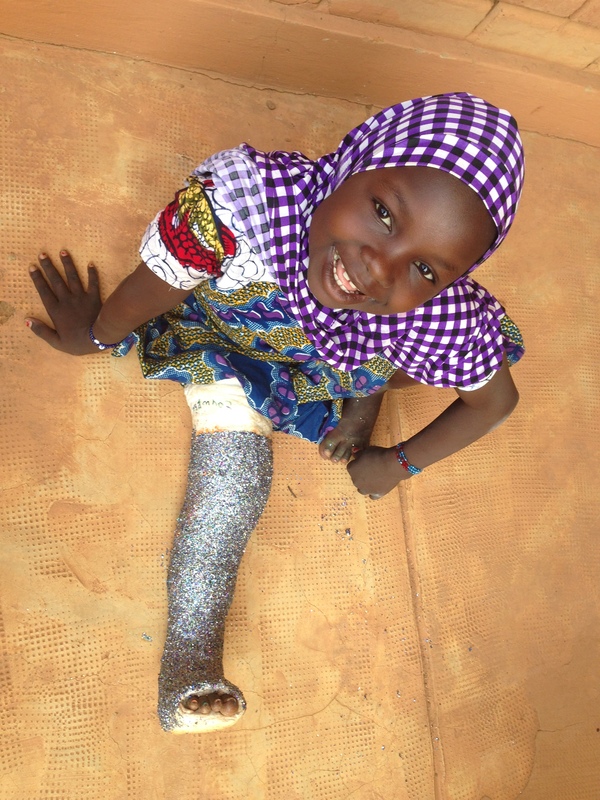 As it turns out, it was for a good cause – Zouera had her cast taken off because her foot was healed! This was exciting news for everyone, since Zouera had already worn multiple casts on her leg over a period of several months. We lost a Wise Man, but she regained her foot, and we were all happy for her. But it still left us one Wise Man short. Thankfully, the cast-cutter spared our King, and the children went and recovered it from the garbage can. They ceremoniously brought it to the art therapy room. I was surprised and pleased, even though I do not encourage our patients to go digging through the trash (I promise). It was more challenging logistically than I would have thought, but long last, our three Magi were united, even though one of them had to be held up for the picture! I love working on joint projects like this with the kids, because everyone gets involved. Not just the three kids with Magi-casts. The other kids at the hospital were also very interested in what we were doing and they asked all kinds of questions, like “Why would you paint these old men on their casts?” Through their questions, I was able to share the Christmas story. Then at the end we all worked on a nativity scene together (with old water bottles, construction paper, clothes pins, and cotton balls). The Wise Men followed a star in search of a King; a King who would bring justice and peace, a King who would restore the broken and bring healing to the people and to the Land. The patients at our hospital are in search of the same thing – healing, restoration and peace. Our prayer is that they encounter the King while they are here with us, even if it is through a painting on a cast. We had the privilege of hosting a workshop at the hospital recently on the topic of inclusive education, specifically for those with physical disabilities. This workshop was organized by IAS (International Aid Services), and it was a great event – very encouraging and very informative. 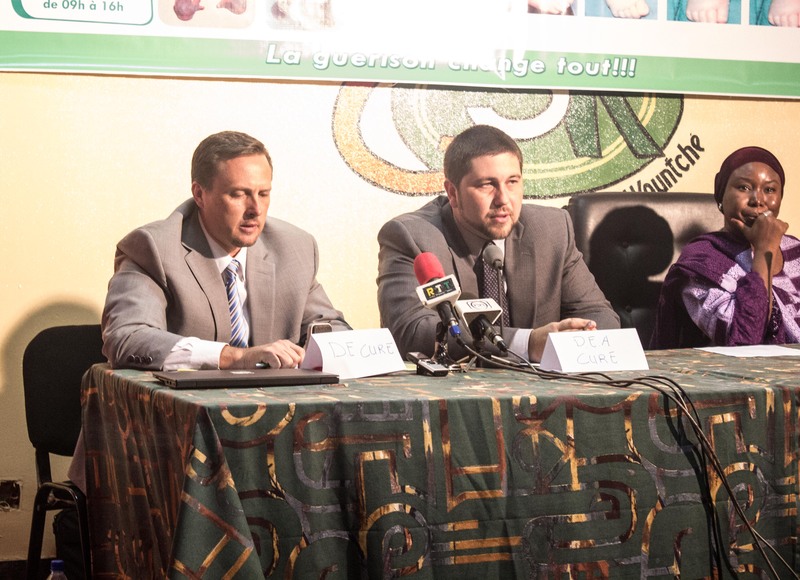 A number of different partner organizations were present, including representatives of the Nigerien Ministry of Education (specifically from the Inclusive Education Division), Handicap International, the Nigerien Federation of Handicapped People, CBM, Plan International, The Leprosy Mission and others. And of course, the venue for the workshop was the CURE Hospital here in Niamey, which was fitting and appropriate given the subject matter. We were happy to host and to participate in this important event. IAS Workshop at the CURE Hôpital des Enfants au Niger. Photo credit – Paul Hayes. One of the representatives of the Ministry of Education gave a presentation on Niger’s National Strategy for inclusive education, which was very interesting. It was encouraging to learn about the national strategy, and to know that Niger even has a national strategy, since that is not always the case in every country, and represents at least a good first step. We learned about the integrated approach to inclusive education, as well as a number of other related themes, including accessibility. One of the things that she shared regarding the importance of accessibility really struck me – she offered an example of chalkboards that are inaccessible to students in wheelchairs because they are too high up on the wall. 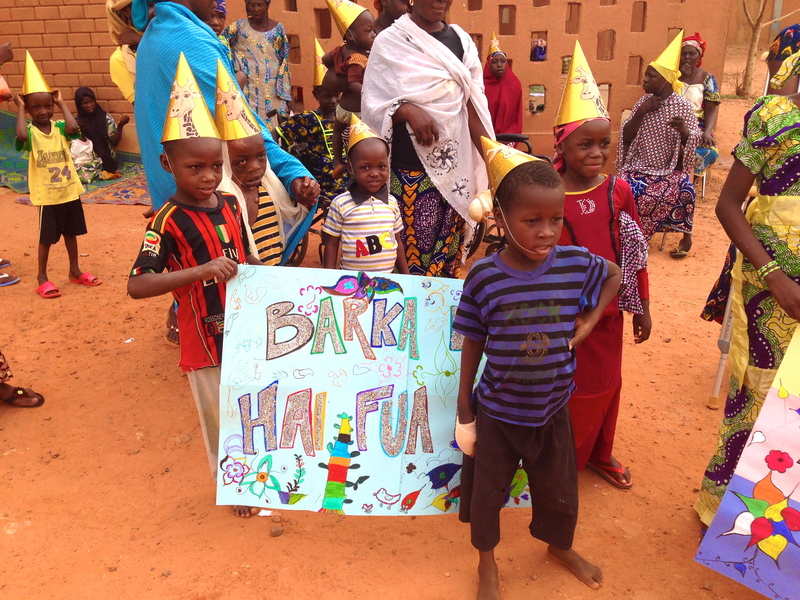 This is a common problem in Nigerien classrooms, but there is an easy solution – simply lower the chalkboards (especially since most of them are painted on the classroom walls with blackboard paint). She pointed out that even though this may seem like a small thing, you should never underestimate the pedagogical impact being called up to the chalkboard has on a student. That is so true, and I remember going up to the chalkboard in front of the whole class from my own days as a student. That mixture of anxiety and pride. It really is a kind of a rite of passage for young students. I never really thought about it before, and I never considered what it would mean to not be called up to the chalkboard, ever, or to be called up and to be unable to reach it. In this case, a simple solution is available. Lowering a chalkboard is an easy thing to do, and something that could have a huge impact on everyone involved – on a child with a disability in that class of course, but also on the rest of the class. However, things are not always that simple. Sometimes ensuring accessibility requires a lot more, and this is a challenge for us at the hospital as well. We try to make everything we do accessible, and not just physically accessible with ramps or handrails – which is of course important – but also in a broader sense. At our hospital we try to cater to children who have physical disabilities, in a context and culture where both children and those with disabilities usually overlooked, and never seen as the priority. We also had a representative from Handicap International give a presentation on the work they have done in inclusive education, throughout the country. It was very interesting, and encouraging to hear of the progress that has been made. Still, however, there is much work to do. 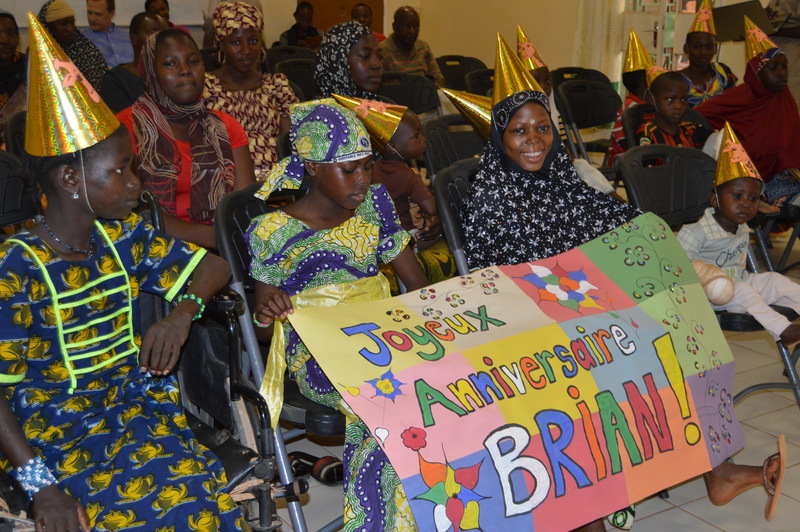 He shared a sobering statistic – 78% of people with physical disabilities in Niger are not educated and 58% have no gainful employment or means of supporting themselves. It is no wonder then, that for so many people with disabilities in Niger, the only option they have is to beg for money on the street. We also heard from Mr. Stephen Mwaura, who works with IAS on inclusive education, and is based in Kenya. His presentation was also very informative and challenging, and I really liked something he said in the beginning of his talk. He said that of all the challenges that we face with inclusive education, including the securing of support and funding, lining up resources, lobbying for governmental buy-in, the biggest challenge is changing attitudes. Until people see that children with disabilities have a right to education and deserve to be invested in, and that they have a contribution to make to society, progress will difficult and slow. We have found this to be true in the work that we do as well. Many times people are unwilling to invest in the healing of their child because they feel like it is a waste of time. Eventually, and unfortunately, parents who have been told over and over that their child can never be healed, and that the situation is hopeless start to believe it. They get to a point where they are not even willing to try to find healing for their children. Mr. Mwaura also spoke about how many of the disabilities that prevent people from being educated throughout Africa are not congenital and actually preventable. Many are the result of negligence or a lack of access to qualified medical care. But in either case, the result is the same: exclusion, rejection and marginalization. The whole goal of inclusive education, therefore, is to remove barriers – and that is exactly what we do at CURE. At CURE we believe that healing changes everything, and the same is of course true for education. Nothing brings us greater joy than seeing children who were given up on and seen as hopeless reach their full potential and become the people that God intended them to be. Over the past 4 years, I have had a lot of fun decorating casts with the kids here at the hospital. I am constantly trying to think of new ideas for working on casts, and always try to do something different. 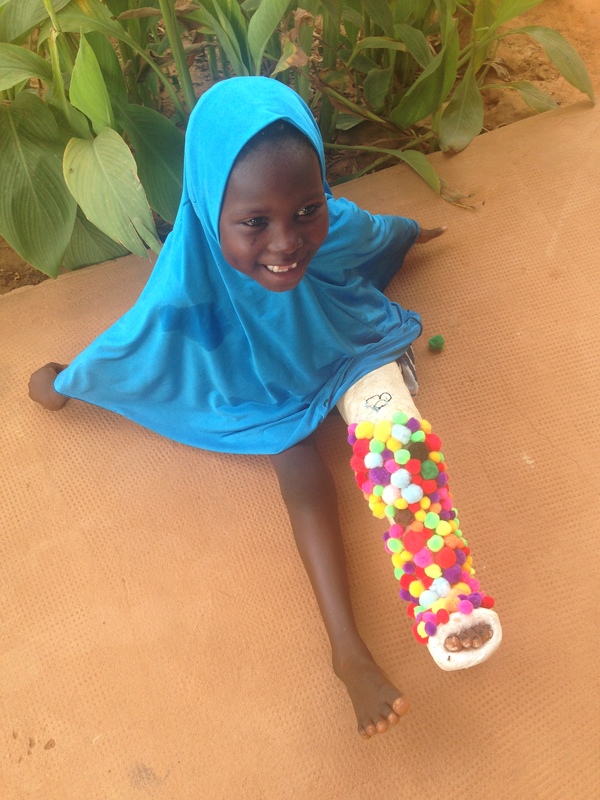 The other day, I stumbled upon an idea that is different from anything I have done before – instead of painting the cast, or going over it with markers, I started gluing little pompoms/fuzzy balls onto the cast of a little girl named Aicha. It came out nicely, and I was very pleased, especially because a bunch of the kids came over and joined in, helping me and Aicha out. I love it when we are able to work on something all together like this, especially when it is with a kid like Aicha, who is extra quiet and reserved. It focused all of the attention on Aicha, who is usually on the sidelines. She remains pretty quiet throughout, but had a big smile, and was giggling with the rest of the kids. The following week, one of the girls who had helped work on Aicha’s cast, Zouera, came to the Art Therapy room for a session. Zouera has been at the hospital for awhile, and has already gone through a number of casts, which she and I have decorated together. 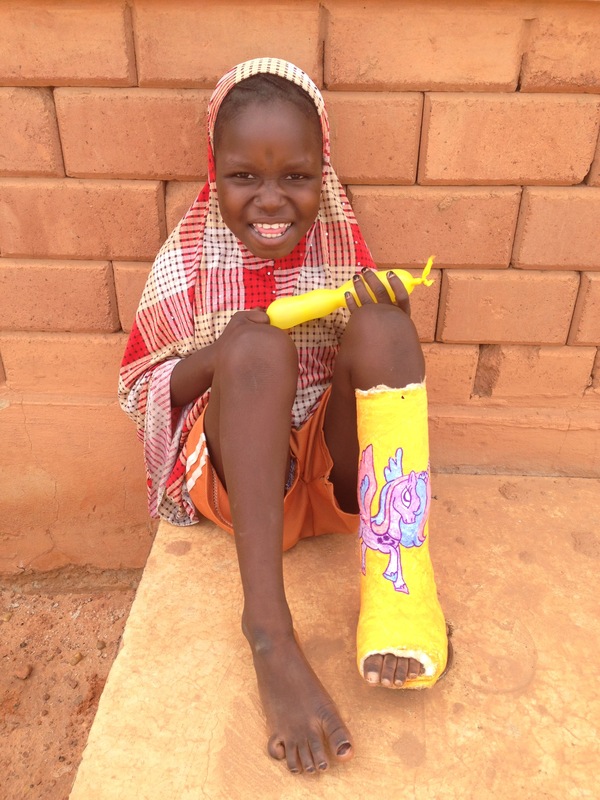 Many of the children who come in do not really know what they want to put on their cast, but not Zouera. She was very sure of what she wanted every time. We have done flowers together, princesses, and other patterns, all at her request and under her direction. We could have just painted over the older paint and the dirt, but Zouera had a different idea, inspired in part by Aicha’s pompom cast. She wanted to cover her whole cast with glitter. Honestly, I wasn’t sure it would work that well, and I imagined glitter going everywhere and getting on everything except her cast (which glitter is kind of notorious for). But I knew that we should try her idea no matter what. So we doused her cast in glue (which did go everywhere and got on everything), and then poured glitter over her entire cast. The results were immediate and stunning. It seriously almost took our breath away. I am consistently amazed by these kids. Most of them have never done any kind of art work before. Most of them have never even held a crayon in their hand, or used scissors, or glue. But aside from that, most of them have not had the opportunity to explore their natural creativity because from a very young age they are helping with the cooking and cleaning and taking care of younger siblings. I am not saying that they never have a chance to play or have fun, or that all the hallmarks of what the Western world considers “childhood” are missing from their lives entirely. But I am saying that they grow up quickly. They have to, especially when they are dealing with some sort of physical disability on top of everything else. Their lives, and the lives of most Nigeriens who live in remote, rural areas are all about survival, and survival does not leave much room for creativity. That is why what Zouera did, and what so many of these kids do at the hospital is so amazing. They are given, often for the first time in their life, the freedom and space to be creative, to be silly, to try and to fail, to dance and to sing and to cover things in glue and glitter. This may sound like a small thing, but it is not. It is big, and it is brilliant, in every sense of the word. These kids are full of wild and wonderful creative energy, and when they finally have the freedom and space to set it free, they shine. 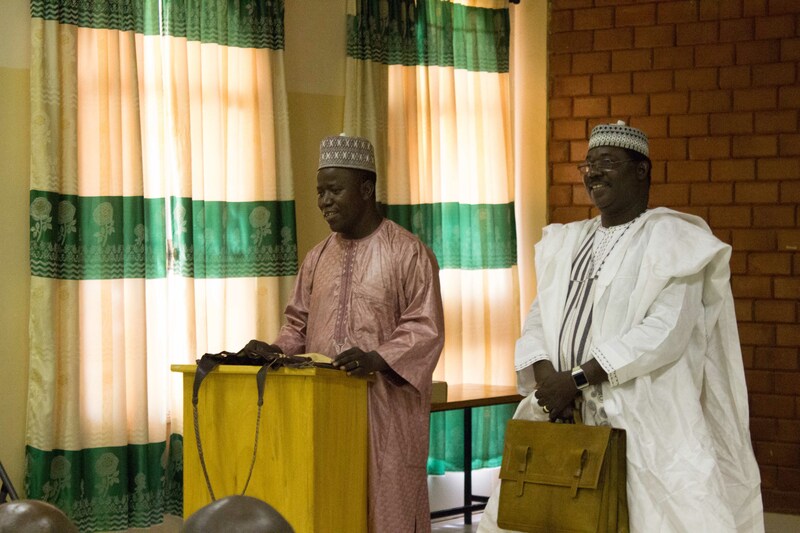 Our Spiritual Director at the hospital, Pastor Hassane Dan Karami, recently resigned from CURE in order to join Samaritan’s Purse in their effort to rebuild the destroyed churches of Niger. 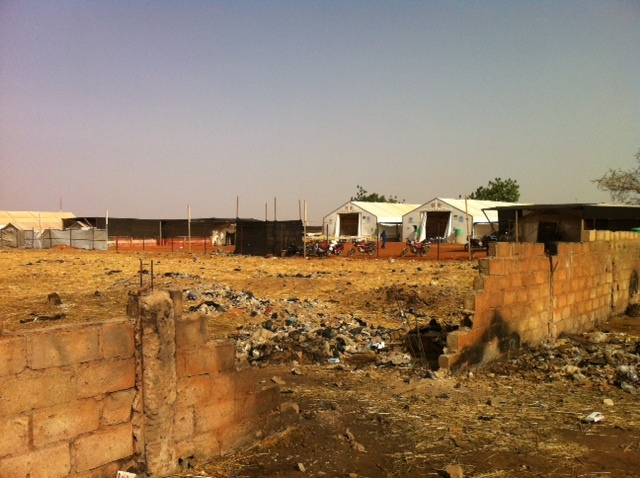 In January 2015, a wave of violence across Niger saw many churches and other Christian properties destroyed. It was a traumatic and trying time for the whole Christian community in Niger, and since that time it was clear that Hassane had a burden for the reconstruction of the Nigerien Church, both physically and spiritually. So while we are sad to see him go, we are aware of the importance of the work he is going to do. Plus, we know he is not going far and will remain a part of the CURE family. 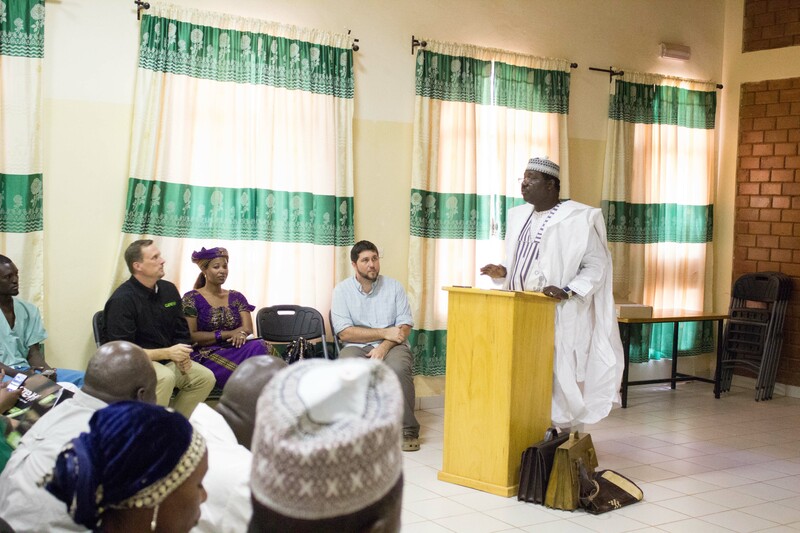 “Pastor Hassane has been a pillar here at the CURE hospital in Niger from the beginning. He has served faithfully as both the Spiritual Director, but also as one of the key leaders of the hospital, and he has fulfilled both roles with humility, dignity and grace. Almost all of you here call Hassane “Papa,” out of respect, but in many ways, he really has been like a father to everyone here, and we have all learned from him and benefited from his wisdom. Personally, I had the privilege to work very closely with Hassane, and to see with my own eyes the love he has for everyone and the goodness of his heart. I have witnessed his love of our patients, their parents, and of our personnel, and seen him demonstrate this love over and over again, either through providing prayer, counseling, advice, or just friendly conversation. I have also seen him give of himself in every way. Hassane is the kind of person that does not hesitate to help someone in need, and everyone here knows that. Many, many times I saw him give to people who are in need, to patients, to staff members and even to people outside the hospital and in the community. In fact, it is thanks to Hassane that we set up the Solidarity Fund. We use the Solidarity Fund to help people who have real needs in our community. Sometimes it is a patient or the parents of a patient. Sometimes it is a staff member. Sometimes it is a total stranger who shows up at the hospital and has nowhere else to turn. 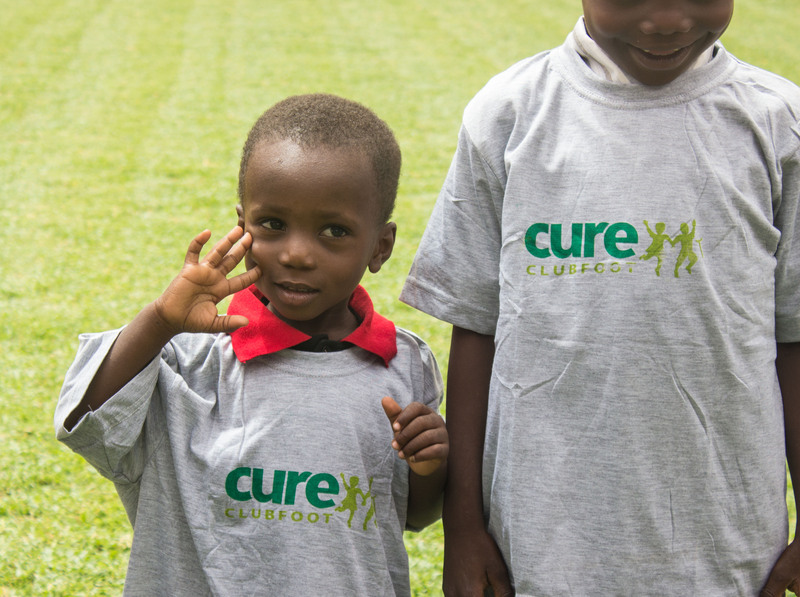 At CURE we try to help as many people as we can through life-changing surgery, but unfortunately, there are people who have real needs that are outside the scope of what the hospital is able to do. It could be helping someone with some money to enroll their children in school, or helping someone rebuild their roof after it collapsed. I say it is thanks to Hassane that we set up the Solidarity Fund, because when I first arrived here, I began to notice that all these people kept coming to Hassane, and he would give them his own money out of his pocket. He never spoke about it to anyone else, but I was with him in his office, and I saw how many people he was helping. Finally, I told him, “You shouldn’t have to help all of these people on your own.” So we thought about it, and finally we decided on starting a Solidarity Fund, that all of our employees could contribute to, which would be used to help people in exceptional circumstances. Over the years, this Solidarity Fund has helped a lot of people, and it started with Hassane’s generosity. For me, this is just one example of who Hassane is, and it really shows his heart for others. Before I finish, I would like to read from the Bible, in the Book of Proverbs (since Hassane loves proverbs, especially Hausa proverbs). Proverbs 11:25 – “The generous man will be prosperous, And he who waters will himself be watered.” I love this image, and I think it is very fitting for Hassane. He is someone who “waters” others, and I am sure that almost everyone here today has been “watered” by Hassane and his generosity. He has spent 5 years watering this hospital faithfully, through service, through prayer and through leadership, in a very dry and thirsty land. We have already seen the fruit of his work, and I know we will continue to reap the harvest for years to come. Here are some pictures from the ceremony. Photo credit to Fanny Franceschi. 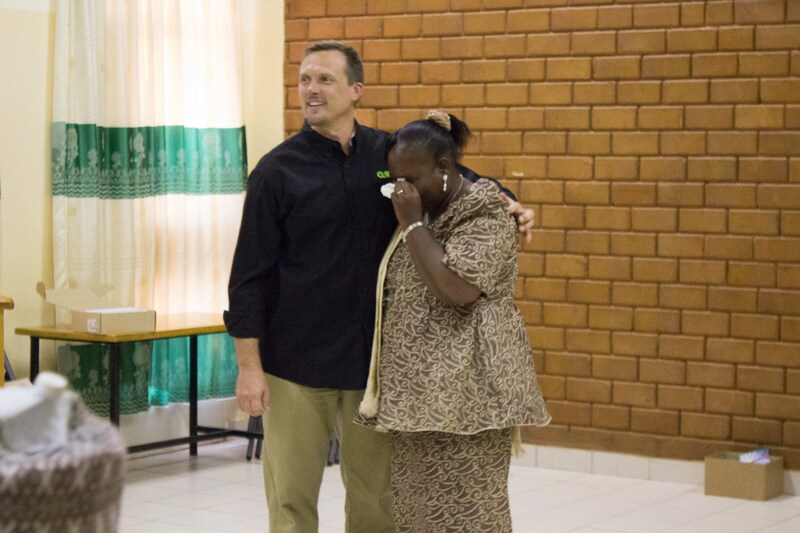 We had a few other goodbyes on the same day, including Daouda from the finance department. And Natalie, one of our nurses in the ward. Pastor Hassane was able to share with everyone. Hassane and his wife Mary. 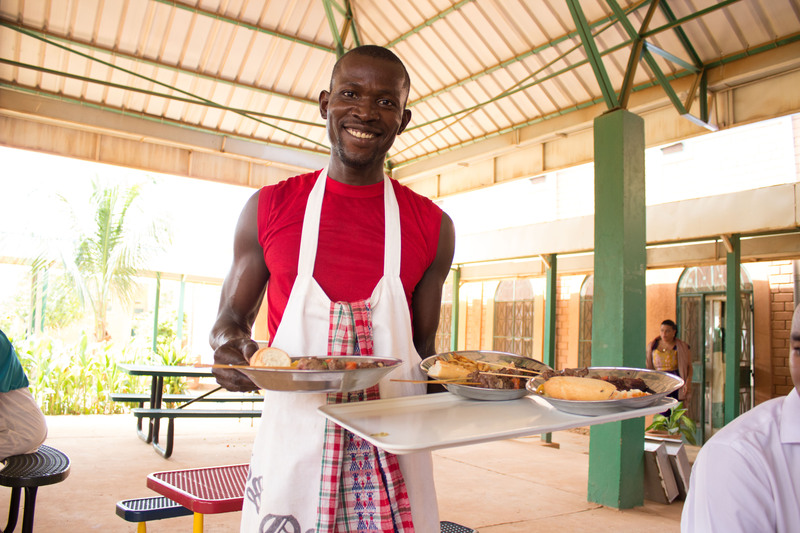 Of course, Issoufou and the kitchen staff prepared a great meal of brochettes and fries! 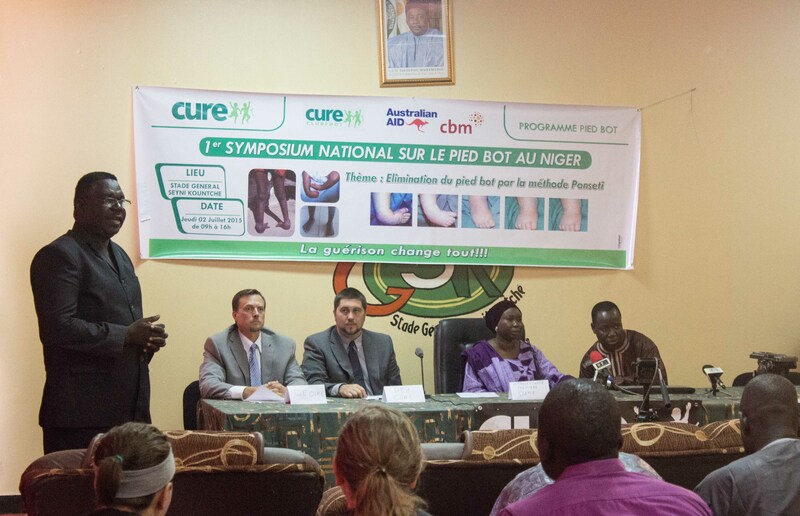 July 2nd was an exciting day for CURE Niger – the CURE Clubfoot program hosted the first ever National Symposium on Clubfoot in the country. It was held at the national stadium, and it was a great success. There were over 100 participants, and the event was well covered by the local media. 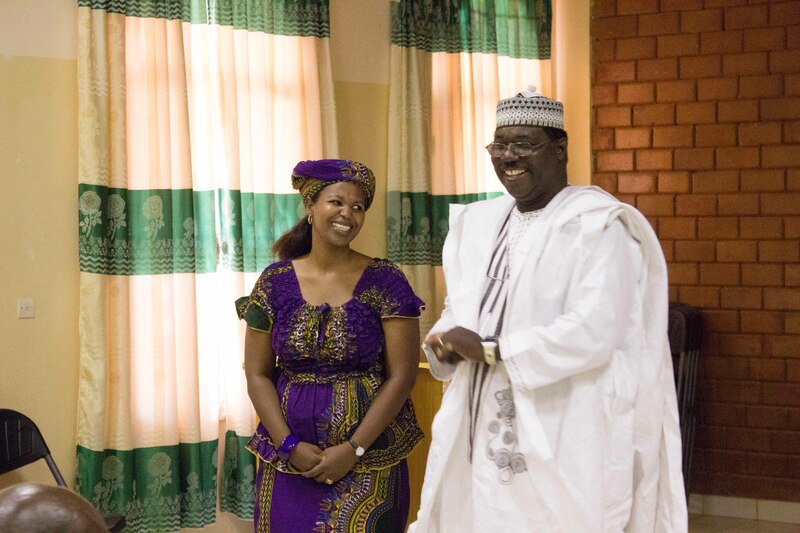 The Symposium was officially opened by a representative of Niger’s First Lady (who is also a physician and surgeon), and overall many other doctors and others who work in the health sector were present. 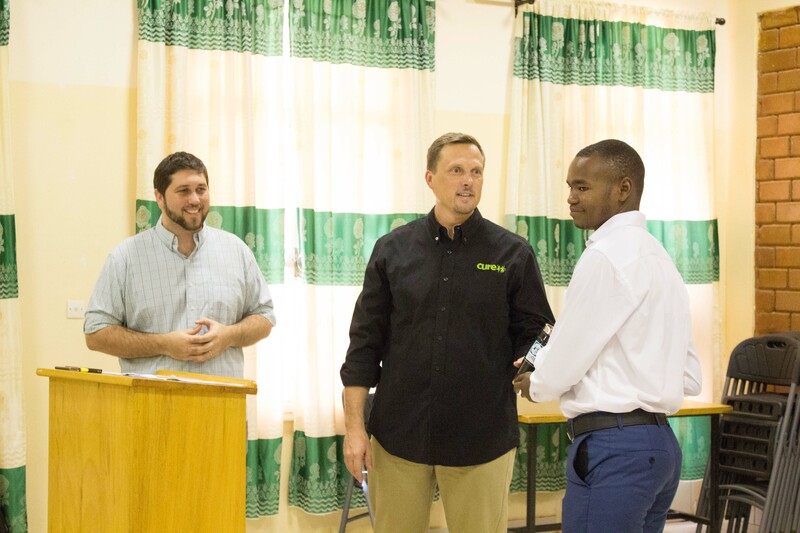 It was an opportunity for Brian Van Hall, our Executive Director to share a bit about the Clubfoot program, but also about the CURE hospital and CURE in general. Everyone present was invited to come and visit the hospital. The Symposium was timed to coincide with the visit of Dr. Theuri, who is the Medical Director of the CURE hospital in Kijabe, Kenya. Dr. Theuri was one of 3 surgeons who came to Niger this summer, to help cover for Dr. Negrini while he was away on vacation, and we thought it made sense to have our symposium on clubfoot during his stay, since he has played such a big role in the Clubfoot program in Kenya. 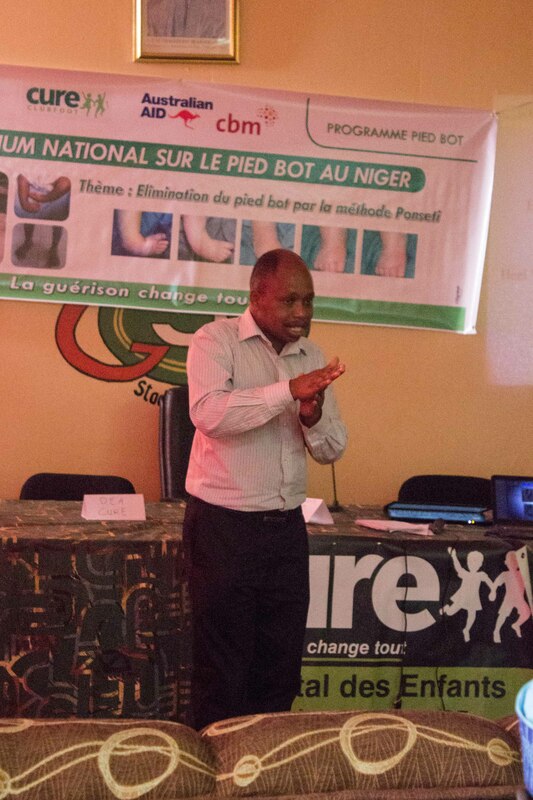 We also had Professor Sunna, a Nigerien Orthopedist at the National Hospital (Lamordé) here in Niamey. He gave a lecture on clubfoot and the Ponseti Method, and it was great to have his participation as well. One of the 10 clubfoot clinics in the program is at Lamordé, and they do a great job. All of the 10 clinics were represented at the Symposium, and we were able to hear from the team from the clinic in Maradi, who has also been very successful at recruiting patients. They were able to share some of the lessons they have learned along the way. We also heard from Pastor Hassane, who serves as the Counselling Coordinator for the program, and who spoke about the importance of the counsellors, who serve as patient advocates and are able to advise the parents of the children and walk with them throughout the course of their treatment. Moutari Malam-Saddi, our national Clubfoot Coordinator did a great job organizing the Symposium, and helped moderate a lively discussion on the sustainability of the program and the future direction it needs to take. All were in agreement that the different actors in the health sector, and especially the Ministry of Public Health, need to be more involved in the program if we are to truly reach our goal of providing treatment for clubfoot to every child born with the disability. Some suggestions were to begin including the Ponseti Method in the curriculum for all medical students and nurses, and to continue to train health care professionals on clubfoot treatment. Overall it was very encouraging to see so many of Niger’s health care workers so involved in the discussion and dedicated to reaching the maximum number of patients through healing. We also got to see a demonstration of the effectiveness of the treatment, as a football match and race was held with some former patients of the program. It was amazing to see them run, and exciting for them to have a chance to run on the grass at the national stadium. 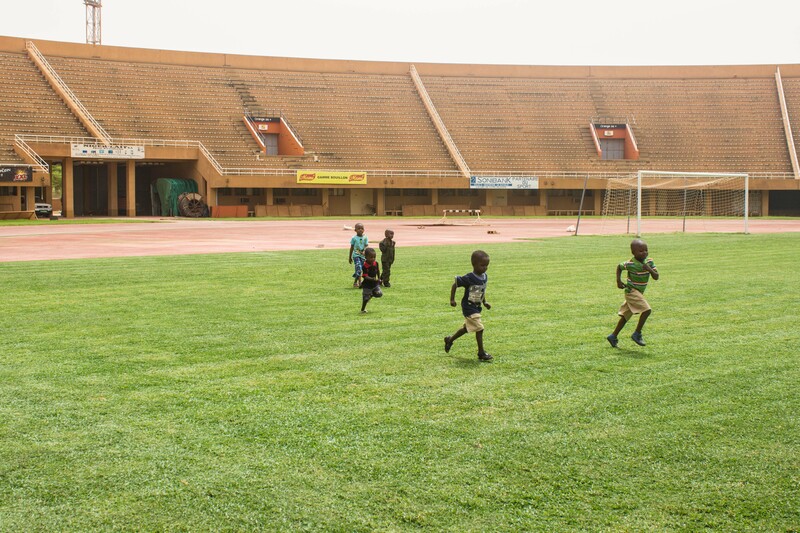 Who knows, maybe some of them will grow up to play for Niger’s national team! Here is a short news clip covering the Symposium, as well as some pictures (courtesy of Fanny Franceschi). Dr. Mele Djalo, the representative of Niger’s First Lady, Dr. Malika Issoufou, Moutari Malam-Saddi CURE’s Clubfoot Coordinator, and Dr. Theuri. Dr. Theuri giving his lecture. Pastor Hassane presenting at the Symposium. 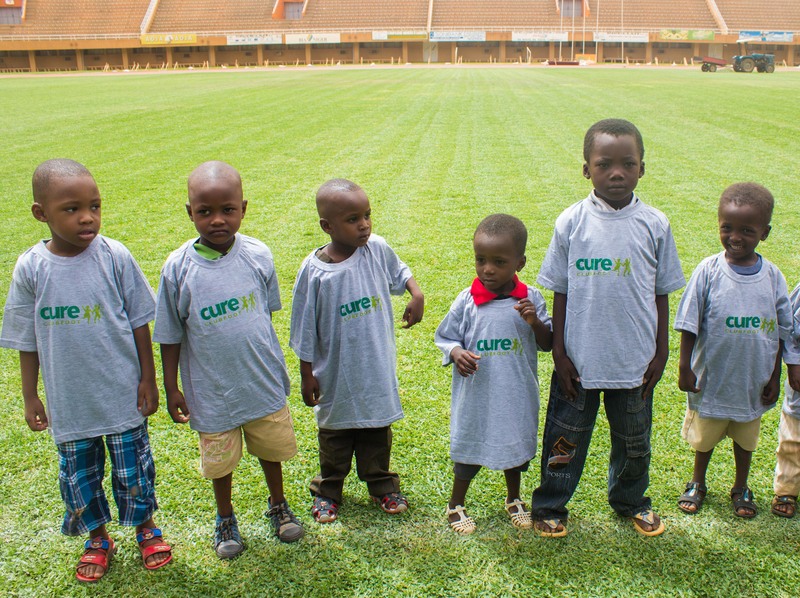 These kids are all former patients of the Clubfoot program, and they were able to run and play on the field at the National Stadium. 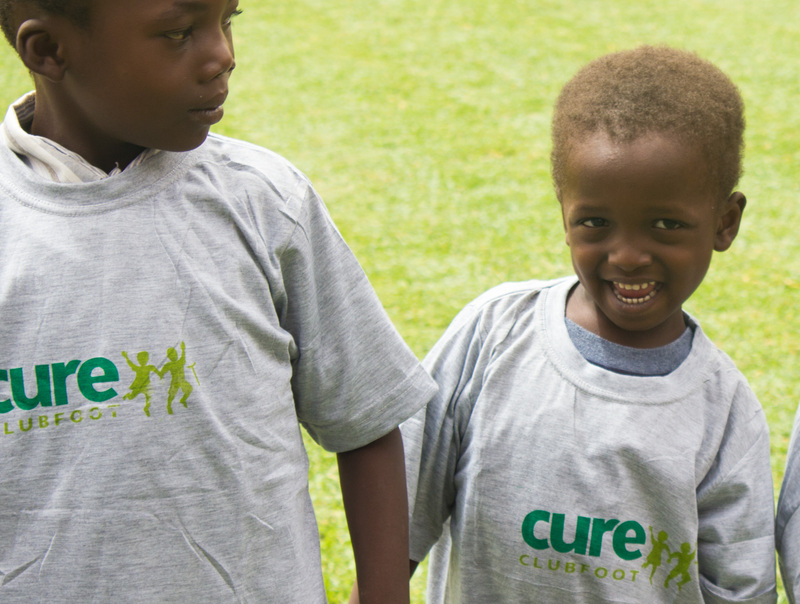 All the kids got Clubfoot t-shirts. Uma was a hard shell to crack. She has been at the hospital for a while now and she is the only patient who has ever refused to have her cast painted. She would see kid after kid with their painted cast and I would try to entice her with different ideas of how I could decorate her cast, but she was not having it. I’m not going to lie, this kind of hurt my ego. I couldn’t understand why she wouldn’t want to add some color to her white cast. I was determined to get down to the bottom of her aversion to a decorated cast. She would come to art therapy and she would draw or paint, but she was mostly very serious while doing it. The truth is, I wasn’t so concerned by the fact that she didn’t want her cast painted as by the fact that she seemed to have erected a barrier to protect herself from the outside world. The fact that she seemed to be so guarded. I wanted to be able to get through to her. Today, I sat with her and started drawing different pictures on a piece of paper that I thought might catch her interest. After quite a few pictures, she cracked a little smile. Much to my amazement, she said she changed her mind and that I could paint a unicorn on her cast! Of course, unicorns are pretty awesome, but I don’t think that it was the whimsical nature of the unicorn that caught her attention. I think it was the steady persistence that eventually caused her to let me in. One of the things that often blows people away when they visit Niger and the hospital, is how open the kids here are. How they are so quick to get excited when someone comes to visit, and how quickly they latch on to visitors who show them even the tiniest bit of kindness and love. I think this is definitely true. The kids here are so ready to give love and to receive love. Sometimes it seems like they are just waiting for an excuse or opening to come and give you a big hug. But there are also other kids that act differently. They are not as carefree. They might come off as angry or sad and they might push you away altogether. These are not the kids that stick out in a crowd of happy, bubbly kids. These are the kids that avoid the crowd, the kids that, for whatever reason, need more time and patience, and a little extra love and care. Sometimes they’re just waiting to see if you to will make the extra effort to come and find them. To look beyond the crowd and seek them out. Sometimes it is discouraging when you make an extra effort, and it feels like a hopeless cause when your efforts fail time and time again. But it is worth the effort. These kids are worth the effort, and they are worth pursuing. Every kid, whether they show it or not, wants to be loved and cared for. And often, the ones who act like they want it the least, want it more than anyone else. 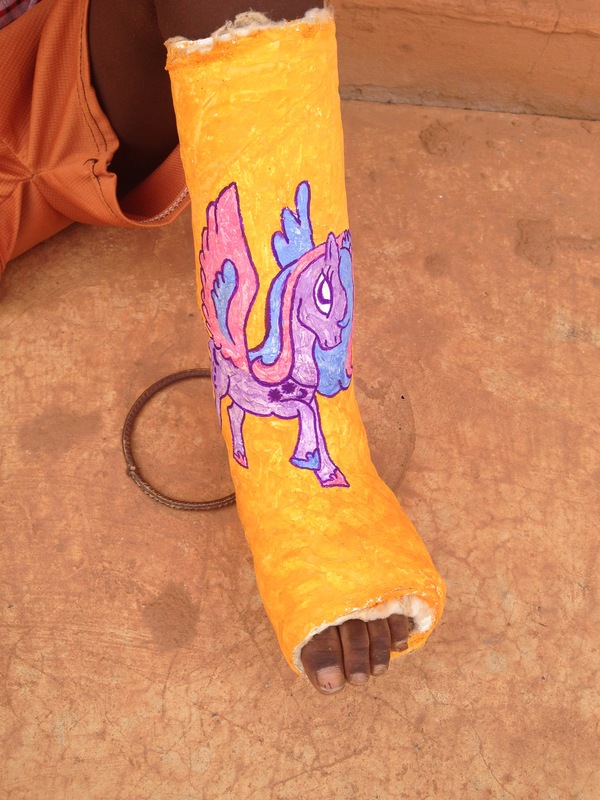 It was always only a matter of time before a unicorn ended up on a cast. If you know Brian Van Hall, our Executive Director, you know that he LOVES surprises and LOVES being the center of attention. Just kidding. In fact, the opposite is true, but we wanted to celebrate his birthday in a very public way, and acknowledge him anyway. The kids at the hospital got really excited last week when I told them about the plan to make birthday signs as a surprise for Brian. While we were working on the signs, one of the kids asked me, “Are we doing this for the director because he’s so nice?” I love that question. I told her that’s exactly why we’re doing it. That innocent little question from one of the kids says a lot. Here in Niger, culturally it makes all the sense in the world to do something to honor the “Director” (with a capital D), no matter who he is, because he is the boss. But this child was able to see that what we were doing was different. We were not doing something for “the Director,” we were doing something for Brian. He is an amazingly skilled hospital administrator and leader, but he’s also so caring, nurturing, sensitive, and humble. 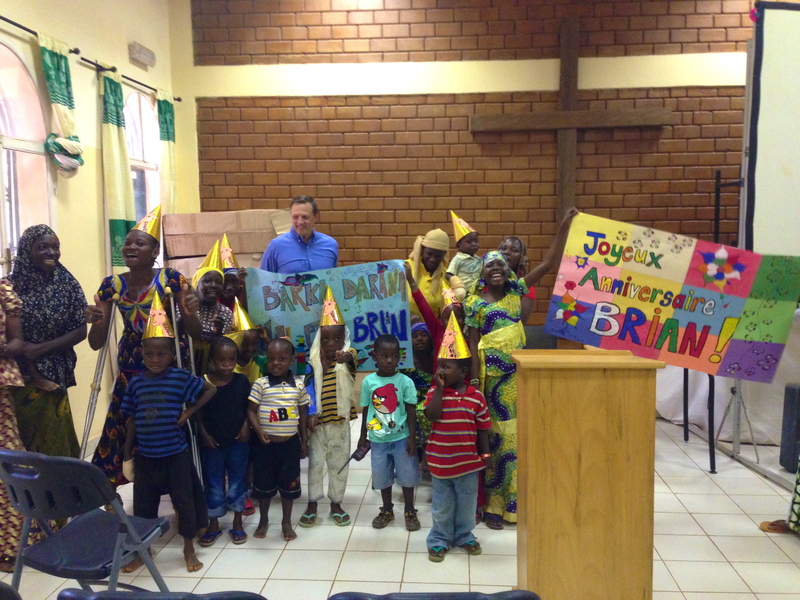 On Friday morning, before devotions, the kids (and many of the mothers) all gathered together with the signs that they made, and put on their party hats. They all marched over to the chapel, singing “Happy Birthday” in French, and burst into the chapel to surprise everyone. They were so excited about this party, and even though some paper party hats and a cake are not that big of a deal, for them, this was an event. They sat so patiently and still through the entire meeting and not one of them took off their party hats. They wore them for hours even after the party. Once the meeting was done, we cut the cake and passed it out. Each kid got their piece of cake and maybe only 2 out of the entire group actually started eating it. The rest of them just sat in their chairs staring at the cake as though they had never seen cake before in their lives. Some of them probably hadn’t. They carefully wrapped up their cake in their napkin and said they were saving it for later. I don’t think you would find that anywhere else in the world – kids sitting there, cake in hand, and not eating it! I honestly think they were just so overwhelmed and excited by the whole event that they weren’t really ready or able to eat. They were so excited by the celebration that they didn’t have time to think about cake. I strongly believe that kids are the best judge of character. They know when they’re truly loved accepted. Brian’s revolving office door is proof that these kids feel extremely loved and accepted by him. They are constantly hanging out in his office at all times of the day. He has been nothing but loving and that is why they were so excited to celebrate him on his birthday. I knew my giraffe party hats (from Leon’s last bday) would come in handy one day! When the recent outbreak of the Ebola virus burst into public view and public discourse, millions of dollars were invested in West Africa to treat the virus and prevent it from spreading. Of course the spread of the virus had already been wreaking havoc and destruction in West Africa for months before anyone in Europe or the US knew anything about it, but then people from outside West Africa were infected, and it became the biggest story of the news cycle. It was evident that fear played a large role in keeping Ebola in the news cycle and in shaping the public discourse around it. Even in Niger, where no known cases of Ebola were discovered, huge investments were made to prevent the spread of the virus and to help educate the population about it. There were spots on the radio, huge billboards and a concerted effort made by the Ministry of Public Health to involve all the actors in the health sector in the campaign against the virus. This was all good and important, and probably did help prevent the spread of Ebola in Niger. A billboard close to our house. But recently, another epidemic has ravaged the population of Niger, and barely anyone outside of the country has heard anything about it. A Meningitis outbreak has caused hundreds of deaths in Niger, many of them occurring in Niamey, the capital. Fear has gripped the population, as a shortage of vaccines has put peace of mind out of reach for most, and because of the shortage, price-gouging has kept it out of reach for all but the wealthiest. The authorities even closed the schools for a week to try and slow the spread of the sickness. It seems as though the situation has improved recently, however over the past few weeks, the sound of ambulances have been heard day and night, bringing more cases to the treatment/quarantine center, which is located just around the corner from the CURE hospital. This outbreak has been going on since January, and although it has received some coverage, for the most part it has barely registered as a blip on the radar of most major news outlets. This is the Meningitus treatment center, around the corner from the CURE hospital. Here are the tents of the treatment center. 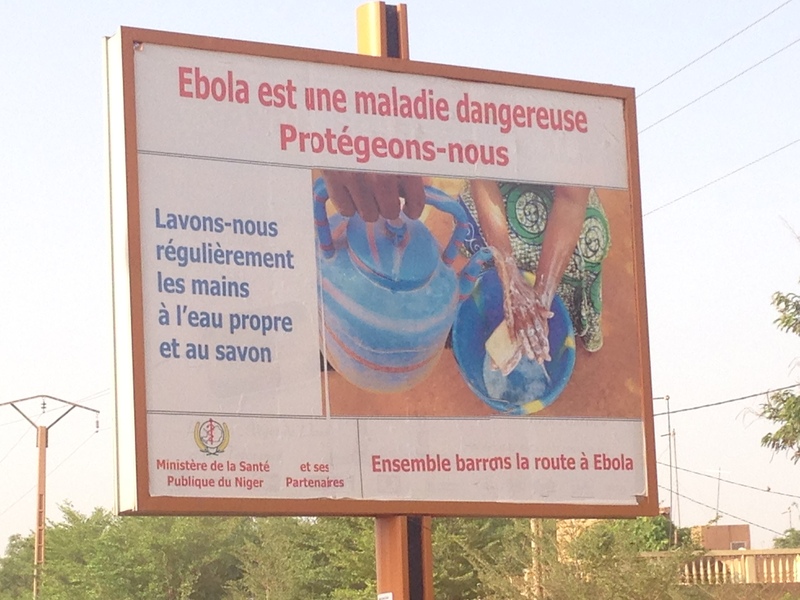 Ebola in Niger – 0 cases and 0 deaths. Meningitis in Niger – more than 6,000 cases and more than 400 deaths. Even though the pace of the spread of the Meningitis seems to have slowed, it is still a threat. 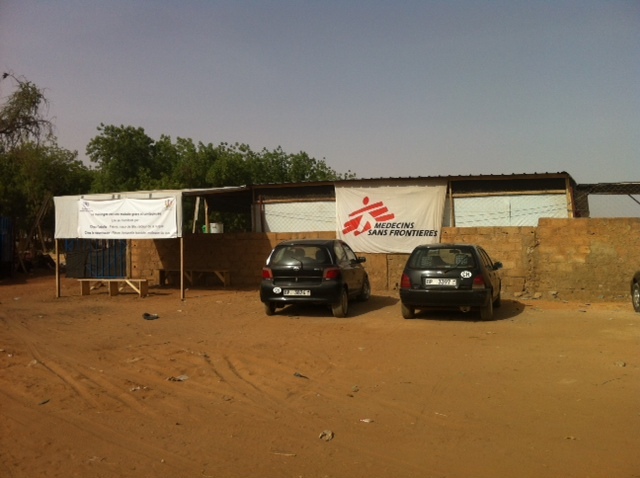 Everyone you talk to here in Niger is convinced that once the first rains fall, the Meningitis will be washed away. They could be right for all I know, and unfortunately, the people of Niger have plenty of experience with this kind of thing – Niger is right in the middle of the “Meningitis belt”). I don’t know about the science of this theory, but it does serve as a potent symbol for hope and healing, especially since we are suffering through the hot season, when rain is close at hand, but still so far away. This imagery is common in the Bible as well. A dry land represents a land of death, where there is no growth or life, only heat and dust. To thirst for water is to thirst for life, and rain brings that life. In Niger people understand this very well. Even when not faced with an epidemic, they know that death is never very far away. They wait for the rain, and pray for the rain to fall abundantly, because when it does they know they can expect a bountiful harvest, and that is the difference between life and death. A good rainy season means death has been put off and pushed away, at least for a while. At least for a season, the danger has past. They know that they depend on the rain, and ultimately on God, who sends the rain. They depend on God and they wait on God because they have faith in God. This dependence is totally foreign to people in the western world. For most of us, if we think about rain at all, we see it as something annoying. It is something that keeps us inside and prevents us from doing what we have planned. We don’t see rain as a blessing, and we certainly don’t pray for it. The idea that our survival is dependent on rain (or God, or anything) is so outdated that it borders on the absurd. It is childish. The current zeitgeist of our culture is one of self-sufficiency. We have built a whole civilization on the principle that we can figure out any problems that come our way because we are so clever. Ignorance and superstition are the only things holding us back. The destiny of the human race is progress, and technology is our salvation.